British astronaut Tim Peake is currently orbiting the Earth in the ISS while we all tuck into our roast turkeys. 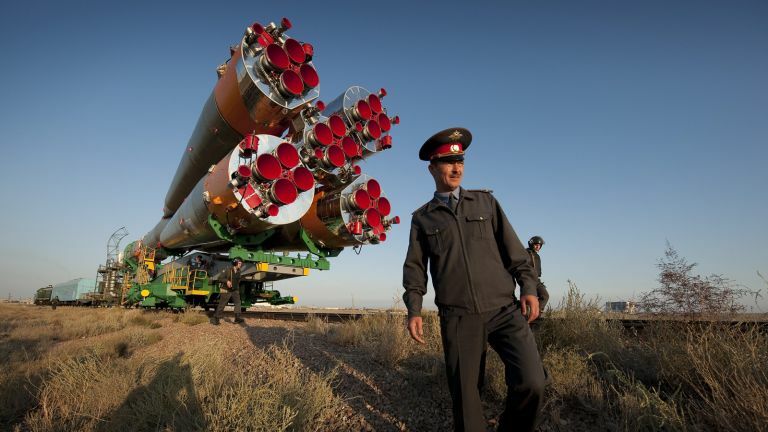 He got there on an old-school Russian Soyuz rocket. Ever wondered what all the knobs and buttons on the steampunk spacecraft's control panel do? It's just like a big arcade game! Well, not quite, but those hours spent playing Elite might finally just pay off. The left joystick is used for throttle control to move the ship around in three dimensions - forwards, backwards, left, right, up and down. Meanwhile, the right joystick is used for adjusting the orientation, or the pitch and yaw, if you want to be all 'Chuck Yeager' about it. The 8-colour VGA screens make this seem even more like one big arcade game cabinet. As we've already mentioned, you'll get a view from external docking cameras when you're parking the Soyuz at the International Space Station, and you'll also get flight and navigation displayed on the screen. Oh, and you'll need to learn Russian to understand it all. Did we mention that? These vital pieces of tech will enable you to talk to mission control, either to tell them that things are running smoothly or that there's been a terrible mistake, you've accidentally been launched into space and you really rather need their help. The one on the left is for the first flight engineer in the left-hand seat, the middle panel is for the Commander, who sits in the middle, and the panel on the far right is for the second flight engineer in the remaining seat. These big orangey valves are hard to miss and that's a good thing, because they're responsible for your oxygen supply. Give them a waggle if you're struggling to breathe. The panel on the far right is the fusebox. Just leave it alone. Does what it says on the tin (which is measuring voltage). It can get pretty toasty in the capsule when you're bowling through the atmosphere on your return to Earth. These three simple switches will enable you to adjust spacesuit ventilation during landing to prevent you from overheating. While reentry can be as hot as hell, space is actually pretty nippy, which is where this handy little dial comes in.After all, you don't want your fancy control console covered in ice, do you? Status indicators [the two vertical strips of buttons in groups of six] This baffling array of light-up buttons is actually your telemetry equipment, which will keep you posted on the current state of all your on-board systems. Some of the spacecraft's really important commands are carried out by pressing two buttons at the same time. Many of these functions are usually carried out automatically, but if things go wrong this little selection of buttons means that astros can take care of business manually. This will go off if there's something that needs your urgent attention. A bit like a notification on your phone, but a fair bit more serious. You can turn it off once it's got your attention, leaving you to fix the problem in peace. It's unlikely that you'll ever get the chance to fly a Soyuz, but it won't be because you don't know how. However, we do feel duty-bound to say that if you DO try to fly a Soyuz-based only on our humble list, rather than years of training, you will almost certainly perish. To Infinity and beyond! Sort of.